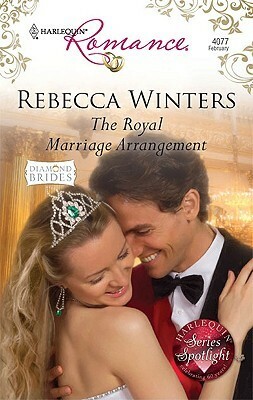 The Royal Marriage Arrangement was written in 2008 for Harlequin’s Diamond anniversary series “Diamond Brides”. It’s a perfectly charming book – one of their shorter ones clocking in at 187 pages so I finished it in a few hours. Alexandra , or Alex, believes herself to be an orphan of a troubled and deceased Hollywood actress. Facing a mountain of debts left by her late mother, Alex heads to a prestigious diamond seller in New York in the hopes of selling of her mother’s famous jewels. However, upon arrival there she discovers the jewels to be fakes – nothing more than paste and costume jewelry. Devastated, she demands to see management and instead is faced with a gorgeous man she assumes to be security. Crown Prince Lucca is faced with a dilemma. He must marry ASAP and it must be to a royal. All of the princesses he’s considered fall short and he is running out of time to ascend the throne of his country on the Italian coast. He’s in New York guarding his country’s prized possession, a rare diamond, when he notices a gorgeous woman kicking up a fuss on the security monitors. Somewhere in there, he discovers that she is actually Russian royalty. The father she assumed was a gangster who was offed by the Mafia in Vegas when she was wee was actually Russian aristocracy. They strike up a bargain – they’d get married to deal with his family and he would, in turn, finance her dream of becoming a plastic surgeon. What follows is a few dozen pages of us readers realizing they’ve actually fallen for each other but neither one of them having the guts to be honest. There are readers who eat that with a spoon – I know miscommunication stories are catnip for some readers but not for me. I often found myself wanting to bash their heads together and scream “JUST TALK FOR CRYING OUT LOUD”. Despite my frustration with them both, I was still taken with this story and smiled at the final confession of true love. It did feel rushed and a bit ridiculous, but all Harlequins of this ilk do. If you’re looking for a few hours of escapist fantasy, then pick up The Royal Marriage Arrangement. I recommend a glass of bubbly prosecco to go with it – something frothy and light, perhaps with a strawberry dropped into the glass or one of these delightful cocktails. Russian royal history resources: If you’re fascinated with the history of the Russian royals and wish to know more, then this page is a good starting place. Learn Italian: The book contains dialogue in Italian and Alex spends most of her first month at the palace in lessons. This website probably would have been a help to her! Diamond Brides series: This is the full listing of the commissioned books for their Diamond anniversary. If The Royal Marriage Arrangement took your fancy, these others probably would as well! I received a copy of this book from the eBook section of my local library.